Organizing your freezer can help you keep track of what you have and use it in a timely manner, avoiding waste. Having a deep freeze can be a great way to save time and money in the kitchen. Not only can you stock up on items on sale, but you can also practice freezer cooking where you store in the freezer a number of meals for later use. Freezer meals have saved my bacon on any number of occasions. Keeping your frozen assets organized can help you use them up before they go bad. There are two types of freezer: upright and chest. There are pros and cons to both kinds of freezer. We have had the same chest freezer for the last 12 years. While it is a little bit of a pain to defrost periodically, the Pantry Challenge helps me do that AND make the most of what we have. It’s also been a little tough to keep organized. Until now. Last weekend I strategized with hubs as to the best way to put some order in my freezer chaos. We agreed that bins would work. He preferred metal baskets — at twenty bucks a pop. I favored plastic — for well, cheaper. The green plastic baskets are from the dollar section at Target, for, well, a dollar. The black stackable bins were $5. So, I spent $25 to get our freezer in shape. I suppose that sounds expensive, but not compared to the $100 I might have spent at Home Depot. And seeing as I spent $200 to buy this baby in 1999/2000, I think we’re good. Now, since I’m in the middle of the Pantry Challenge, I did not empty and defrost the freezer. I didn’t wipe up the spill I found on the bottom of the freezer. But, I did put things in order. Each basket contains a different kind of item: beef, pork, chicken, fish, bacon/sausage, baked goods, vegetables, sauces, etc. I just started filling the baskets and it was all categorized in a matter of minutes! I did leave “freezer meals” on the shelf of the freezer since those are fairly varied and stack well. Thankfully, they were labeled! When I add items to the freezer, I just need to sort them into the appropriate bin or basket. Here’s the Beef Fin. Hubs is not convinced that the plastic will hold up for very long in the freezer. I admit, I am taking a risk. But, I’m guessing that all 9 of them won’t break at the same time, so I will be able to repurpose the remaining baskets if one does prove that they aren’t freezer friendly. How do YOU organize your freezer? THANK YOU! I just purchased a freezer similar to yours and was trying to get it organized, but could foresee a problem of not being able to see what was at the bottom. This is a timely post and a great solution! I’ve off to the dollar store today! That organized freezer is a beautiful thing. Wow, thanks for the inspiration. I’m aiming to get the freezers in both of my refrigerators inventoried and organized today. Your post has reminded me to take the before pictures while it’s not too late. I too was very inspired. I have 3 freezers. We feed 14 people 3x day. So, one upright freezer holds all the bread and related baking and bread things, with butter in the door. The other upright holds all our freezer meals and components. Now the chest freezer, thats a beast! So taking your queue, I “aquired” 4 black milk crates . One for each meat type. They stack so nicely and now kiddos can put stuff away too. I have 2 hanging baskets for other baking goods as well. Now if I can just keep the 7yo from falling in to reach something… just kidding. No child was harmed while putting the frozens away. Milk crates! What an awesome idea! I have a couple lying around…. I was going to toss them, but not anymore! Great idea! I do not have an upright freezer, but I could use some small bins to organize some things. My deep freeze is usually slam packed with food. Since we ranch we always have beef and we butcher a hog about once a year. 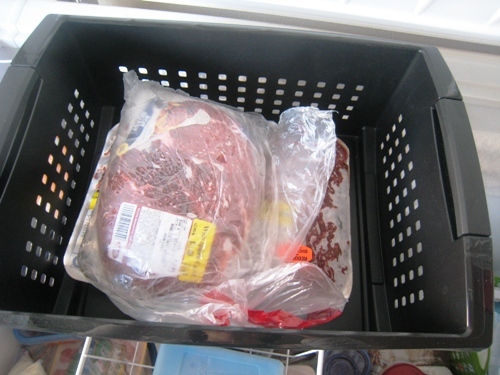 The easiest way I have found to organize is beef on one side, hog on the other and everything else in between. If I keep the beef in the huge plastic bags it comes in it is easier to find what I’m looking for whether it be hamburger, roasts, or steaks. I use my freezer above my fridge for my stockpile of frozen veggies, cheese, and other things. My freezer meals are usually stacked in my deep freeze on top of my supply of meat. I love not having to buy meat at the store (I don’t even buy chicken, we are blessed with being able to trade beef for fresh chickens with a family!) however the only time I get to see the bottom of my freezer is when we get another beef and I have to do the rotation! I love how you organized with the baskets, I think I need to figure out a way to insert dividers in my mess! @Alisha, I think you could make some dividers with tension rods and mesh netting. Could be interesting. Would lids from plastic tubs work for dividers? I have used them on shelves before. I’ve used all sizes depending on the shelf. Great idea! I’d always wondered how on earth you could keep a deep freeze organized. I like the stackable bins idea – please keep us posted on how they hold up. I don’t know if you enjoy thrift shopping, but wire baskets appropriate for the freezer are at my local thrift shop frequently. I outfitted my freezer with wire baskets for under $15–I didn’t find them all at once, but probably in a span of a few months. @Kelli, unfortunately, I am a thrift store dropout. We also have a chest freezer, and also organize using bins/baskets. The freezer came with one hanging bin, which we use for small things – the last of a package of hot dogs, etc. I have two of the metal baskets that I acquired somewhere, and several plastic ones that I got at Target YEARS ago. We’ve been using the plastic ones in the freezer for about three years, and they have held up just fine. We categorize items by type: Poultry, beef, pork, vegetables, fruits, etc. It works great! The baskets stack and can be easily shifted to get to the layers below. I do exactly the same thing and like Ann above, I’ve had my plastic bins for a long time without breakage. I keep proteins in the deep freeze and frozen whole tomatoes (because I have no where else to freeze them). Fruit, veggies, breads, freezer meals, ice cream, etc., all go in the freezer above our fridge or in the freezer side of our spare fridge in the garage. I use smaller bins in those freezers, too. I bought the smaller version of those baskets to stack and organize my spices! We have some in the pantry for snacks and misc. stuff too. We have an upright freezer that came with the house. It’s not that hard to organize and in terms of how the space is used I prefer that to a chest freezer. However, when we have to replace it I’m not sure I’d be willing to shell out the extra cash for another upright. So I may be doing the basket thing some day too. @BethB, when we thought ours was dying, we priced them out. I don’t know that I could stomach paying for a chest freezer! They are all so expensive. @Tabitha (a.k.a. Penny), *Gasp! * I have several diaper boxes and empty wipes containers that I’ve just been waiting to have a use for! Thank you for the idea! Brilliant! I love the idea of baskets in the freezer. I think your hubs is right about the plastic not holding up too long in the freezer. That was my first thought when I saw it. BUT you didn’t spend that much on the baskets, and now you’re going to figure out if this system works for you. If it works, you can always spring for pricier baskets. If it doesn’t work, then you didn’t waste much. We recently bought a new refrigerator, so the old fridge (and of course attached freezer) is in the garage, and I’m finding that stuff just gets tossed in there and I’m having a hard time keeping track of what we have. A couple of weeks ago I retired a dry erase board from my fridge inside and immediately thought to put it on the fridge outside — so we (since my husband puts stuff in there too) could write down what’s in the freezer! We’ll see how it goes. Thanks as always for the great ideas. @P Reis, that sounds like a great idea. I hope it works! We have a small upright freezer. Since I am vegetarian it holds veggies I grow and freeze during the summer. I use small plastic shoe box size containers( $1 each) without the lids to organize the quart size bags of frozen veggies. Keeps them from sliding all over the place and they have held up just fine. I have an upright freezer (too short for the chest…had one and couldn’t reach anything on the bottom). Top shelf is frozen burritos (DH snack of choice), frozen pizza, ice cream and other “snacks”. Middles shelf is “meals” that are frozen. Bottom shelf is meat. On the right is beef and left is chicken with bacon/pork in between. The door holds ground beef packs from Trader Joes, Sausage, frozen bagged veggies, butter, etc. There is a big basket thing on the bottom that hold extra bags of ice & frozen fruit. @Jane, I have an upright, too, and I’m trying to keep things sorted by shelves. One shelf = baking stuff (cornmeal, masa, milk, etc.). Another = meats & broths. Another = veggies & cheeses. Bottom = bananas (I always buy the marked-down ones at the store to use for muffins & other snacky foods) & some misc (homemade cream soups, cooked beans, etc.). The door shelves hold pasta sauce and random bits that either don’t seem to belong anywhere else or don’t fit anywhere else. The freezer side of my kitchen fridge is in serious need of some organization. It’s really narrow and ends up being awkward. Leftover pizza (hooray for Friday Homemade Pizza Nights!) always goes on the top shelf, but bread, muffins, partial bags of veggies, tortillas, etc. just end up crammed in every which way. Your post and the comments reminded me that I have some small metal bins in a closet that might be better used in the freezer. Yay! Thanks, Jessica! I agree with your husband that the plastic won’t hold up. I use those fabric grocery sacks (that I’ve collected for free) to organize my meats in the freezer. While the sides aren’t firm at least it helps me know where to look when I want chicken, beef or pork. @Susan, now if I had thought to use color coded ones, that might have worked. Great idea! @peggy, well, I’m wondering if there is freezer-safe plastic and not-freezer safe? I dunno. Someday I want to have my freezer look this pretty…this is still one of my favorite “Pins”. @Emily @ Random Recycling, that IS pretty. We have a chest freezer. We’ve also purchased 1/2 pig and 1/4 cow. I use the reusable grocery bags to keep things organized. Green bags have pork, red bags have beef. I have a couple of odd color bags that hold chicken and veg. It works great because the bags are flexible and have handles. When we empty a bag, I just fold it up and put it bag in the freezer for the next fill up. They might not last, but maybe we can get them cheap!! Looks great! I use the recycled fabric grocery bags…color code green for veggie, red for beef, tan for chicken…etc for my chest freezer. I’ve also used an old dorm fridge as a freezer for short term freezer items. If you crank the dorm fridge down to the lowest setting it will keep frozen things frozen. (but you need to freeze the items BEFORE storing them in a dorm fridge. Timing is everything for finding an inexpensive one. Look on Craig’s list at the end of the semester. I got an almost new one for $15. I have been thinking about this topic recently, for the past month or two, and had decided I was going to do just what you did, but I haven’t yet done it. I find that your blog addresses many of the topics I care about or am thinking about again and again. Thanks for the inspiration. Up until now I’ve been putting things in grocery bags, but I didn’t like that system, if you can even call it a system. I think you could find similar bins at the 99 cents store. I had a chest freezer for years and I vowed to never own one again.. I bought the largest upright freezer you can buy.. and I LOVE it. The bottom pull out basket has lots of bags/blocks of frozen cheese that I got last year free.. I think there are still about 50 or 60 of them. I have some bags of cranberries down there too. In the door compartments are lots of nuts, flours, almond & corn meal, chocolate bars, & frozen liquid coffee creamers. @KimH, Just a thought, I know they are frozen, but in food handlers class they taught us to put the “dangerous” or raw foods at the bottom and “safer” foods at the top. That way if your foods do thaw, you don’t have raw meat dripping on breads, for example. I don’t have a stand-alone freezer but my refrigerator combo does have frozen poultry on the bottom and things like frozen veggies and breads above. Hope this makes sense. @Pamela J, Thanks, good food for thought, no pun intended. 😉 Makes perfect good sense. @Pamela J, that is a great point! Thanks for sharing that one. I am so doing this! Great idea! I hope the plastic works out. Anyone have ideas on what to do with the huge boxes of frozen foods you get at Costco etc? I would love to organize with baskets but should I empty the big boxes and save any reheating directions? Thanks for any ideas! @marisa, that’s what I would do. You could either tape the instructions to the bags or just store them with your cookbooks. Those boxes are bulky. I usually cut the prep instructions (and nutritional info grid), and stick them inside the resealable plastic bag (or, if they don’t come with one, inside a freezer quart or gallon bag) with the food. (I do it even for non-costco sized foods – regular packs of freezer waffles stack SO much better out of the cardboard box. We use plastic file crates/milk crates to organize the freezer. One for butter & baking supplies, one for meats, one for fruits & veggies. I’ve had them in there for 3+ years and they haven’t cracked. Right now we also have LOTS of chicken in there from a Zaycon order, so that is bagged in meal-sized portions and all those ziplocs are kept in extra cloth shopping bags we had around the house. I do what Bethany does except my bags are a mesh weave. I used to use baskets similar to yours, but I think the bags work better. Because of space issues, we have two small chest freezers–one for elk and salmon; one for everything else. In the summer, we can consolidate everything into one freezer and defrost the other; I just have to keep track so each is defrosted at least once every other year. We are in the process of eating-down our frozen foods so to defrost the freezer and repack it. Thanks for the encouragement! We use cardboard boxes for bags of veggies–tho I really like the shoebox idea! I have saved old refrigerator drawers as well as well-used roaster pans and re-purposed them to store other items such as meats and chicken. An organized freezer is a beautiful thing! Love it. I was wondering if cardboard boxes would work too–I may just go with those, even though they won’t be as pretty. I might try the cloth shopping bags too since I have them around already. I think if I just had things grouped, I would be satisfied. Although I love the idea of having a big organized upright freezer, it’s not practical or economically reasonable for us right now. I got our chest freezer for about $100 at a scratch and dent place several years ago and it has been great–fits in the small space where we have it and holds what we need. If I had an attached garage (ours is a bit far from the house and we live in an area with some heavy snows and such), I would prefer the upright though–it would be so handy in that situation. Thanks for all the good tips. The dollar section of my Target had wire mesh baskets and magazine files for $2.50 each. I picked up a few baskets last night and used them to contain all the miscellaneous packets that slide around our freezer, and I’m hoping to use the magazine file in some way too…maybe sauces frozen flat? I did a similar thing with my freezer. I had an abundance of reusable heavy duty grocery shopping bags, like Trader Joes and Shoprite. I separated all of my meat in those the same way that you did with your bins. My husband just stumbled upon this idea. It is also a great idea and bigger kids could help. I have used club pack cereal boxes after removing the flaps. I have 3 large ones and a small one. I have done the same thing, one for beef, chicken, pork and the smaller one for fish. I put baked goods in the basket and bread products on the shelf. I was warned against plastic in case it breaks. This was free and easy to replace should a box lose its integrity. I just recently acquired a chest freezer. I already have an upright and an extra fridge with freezer. I have put stuff in it, but have not got it organized yet. I use collapsible plastic crates from the dollar store in the upright. 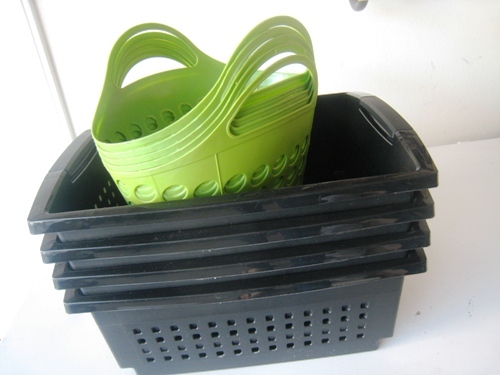 If the plastic baskets break and you have to replace them, you would have to do it several times and it would still be cheaper than the metal baskets. Plus, while the plastic ones are doing the job, you might find some inexpensive metal ones to replace them if you look around. Just a thought. I think the trick is finding metal inexpensively. Hubs loves those for garage storage and they are tough to find at a good price. my hubs and your hubs definitely came from the same planet. 🙂 i heard my husband’s voice when i read your post. too funny. Love this…I was just out peering into my freezer the past week wondering how to best do it. I’ll give this a try. Thanks!!! My freeze is 19cu feet. The freezer came with baskets on the top. The lower level has grid dividers . In those areas I have placed the re-cyclable bags from the grocery. The 99 cent ones. This allows me to bring the bags out easily …the bags are sturdy, take up minimal space and have nice handles for ease of use. I’ve had both kinds. I wouldn’t describe myself as a scrapbookin’, Pinterest-lovin, kind of person. I don’t need to hear angelic music when I open the door. I do however enjoy a sense of orderliness. 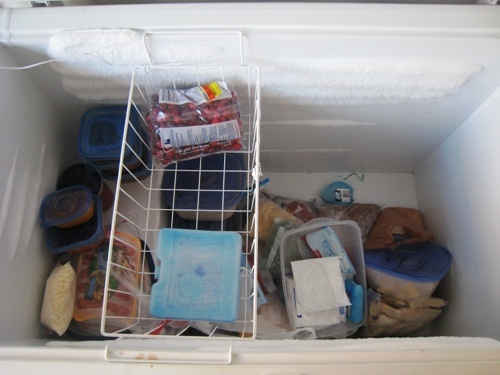 My chest freezer allows me to dump and go, and the built in compartments allow me to generally categorize the contents. My experience with our Upright: Pre-Fishmama. It was free. It was ugly. It was very old. It had mold. It cost us $50 a month in electricity to use. We kept it in an unheated Minnesota garage. We mostly used it to store ice or flash freeze strawberries. Go figure. We didn’t have the heart to pass it on to someone else. Our energy company wanted us to pay $50 for them to remove it. My experience with our Chest model: Pre-Fishmama, Post-DaveRamsey. Our grocery bill was astronomical. My incentive to learn how to lower that bill was to take the savings difference and save up for a chest freezer. It took me 2 months to do that. I learned how to cherry pick during my shopping trips, and also had a place to put everything. And it costs us about $50 a year to run instead of $50 a month. I defrost it about once every three months. A camping size cooler is nearby so whatever is left in the freezer at that point goes into the cooler for 12 hours. No big deal. P.S. I love, love, love the cookbook’s techniques. That section alone is worth the price. I have an upright freeze and I’m using plastic baskets from walmart. They seem to be holding up well so far. As far as labeling them I have a small handheld label maker. I’m think of going one step further and putting magnetic chart on the front with labeled magnets and number to help keep track of what is in there. I also have to say I just found this site and going to try a lot of the things I’m reading. So thrilled to have found your blog, and also your freezer cookbook. Expecting baby #2 soon, so very happy to have lots of amazing ideas for stocking our freezer. 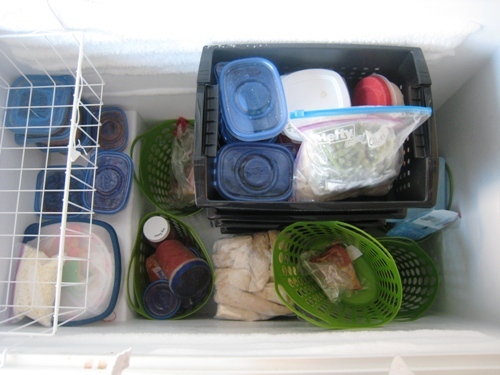 Quick question– How have your plastic stacking bins held up in your freezer over time? Our chest freezer came with the house we rented from my bill 43 years ago. I have no idea how old it is! I am using some plastic tubs and sturdy boxes to keep it organized. They hold ground beef, Zaycon chicken, frozen veggies from last year’s garden and baking supplies The roasts,hams and whole chickens are underneath the boxes and crates. The upright needs some work. The door holds homemade broths, sauces and grated cheese. The top shelf holds bread, bagels and sandwich thins. The basket at the bottom holds home frozen veggies and the middle is a mess. The freezer above the fridge has frozen veggies to use, some baking supplies and powdered milk. The top shelf has my husband’s lunch containers, leftovers and already cooked food. The bottom shelf is a mess? I guess I’m semi organized!